"It would be the height of madness for them to propose an Independency." So wrote Lewis Evans, a geographer and mapmaker, in commentary accompanying his new map of North America in 1755 during the early years of the French and Indian War (when British forces were not the victors). His opinion follows the consensus among observers of the colonial relationship with the mother country, displayed in these selections from 1705 to 1767. - Remarks by Francis Makemie, Jeremiah Dummer, Hugh Jones, Peter Kalm, William Smith, Jonathan Mayhew, Andrew Burnaby, Thomas Barnard, Thomas Pownall, and Benjamin Franklin, 1705-1767. - Rev. Jonathan Mayhew, A Discourse Concerning Unlimited Submission and Non-Resistance to the Higher Powers, 1750, excerpts. What major reasons are offered against the likelihood of the colonies' uniting for independence? What do the commentators see as the core factor in the colonies' desire to remain in the empire? Loyalty? Need for security? Habit? Commercial gain? Identity as Englishmen? Military weakness? Disunity? Are there opposing viewpoints? Where might you find statements before 1763 that the colonies could unite and fight for independence? Contrast the American and European perspectives on the likelihood of American rebellion. How do they perceive the colonies' situation differently? What ethical justification does Jonathan Mayhew offer in his sermon for citizens to abandon "unlimited submission" to governmental authority? Why is he so scrupulous in basing his justification in scripture? Pair these readings with those in #5: Union? How linked are the issues of colonial unity, colonial rebellion, and independence from Britain? What, if any, evidence exists in these selections of the colonies "becoming American"? How are you defining "American" in order to reply to the question? What happened in the years 1763 to 1776 to turn the proud Britons in America into rebellious Patriots? What happened to the "very good deal" the colonists had enjoyed for decades? When did a war for independence no longer seem "the height of madness"?  How did the political relationship between the colonies and Great Britain change in this period?  How did individual colonies and colonists influence and respond to these changes?  To what extent were the colonies and colonists "becoming American"? 1 Another periodical, The American Magazine; or, Monthly Review of the British Colonies, briefly appeared in 1741. "It reared its head above the storm,—it drooped—and died." Charles Henry Timperley, A Dictionary of Printers and Printing (London: H. Johnson, 1839), p. 668. 2 Alan S. Taylor, American Colonies: The Settling of North America (New York: Viking/Penguin, 2001), p. 442. 3 Paul Royster, introduction to Rev. Jonathan Mayhew, A Discourse Concerning Unlimited Submission and Non-Resistance to the Higher Powers, 1750; in Digital Commons, University of Nebraska-Lincoln, at http://digitalcommons.unl.edu/etas/44/. 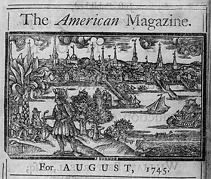 Image: The American Magazine and Historical Chronicle, Boston, August 1745, engraving by James Turner. Courtesy of the Library of Congress, General Collections, #LC-USZ62-51540.